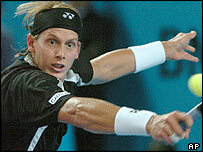 Joachim Johansson collected his second title of the year by beating Ivan Ljubicic at the Open 13 in Marseille. The 22-year-old triumphed 7-5 6-4 in a big-serving battle against the Croat, who lost his second final of 2005 after falling to Roger Federer in Doha. Johansson, currently ranked 11th, will now break into the world's top 10. He said: "I have improved dramatically over the last six months. My serve is more solid and consistent, and I'm also much more patient on court." Johansson also won the Australian hardcourt championships in Adelaide in January. The Swede, who now has three titles to his name after winning Memphis last year, has never lost an ATP final.